What started as 68 BSU alums vying for glory as the most BSU of the bunch has now been whittled down to the Elite 8. Our first four competitors squared off yesterday to lay claim to the first two Final 4 berths. Congrats to 1-seed Dave Letterman and 10-seed Chris Miller who earned the right to face each other on Tuesday April 2 in one of our Final 4 match ups. We’ve seen social media play a huge role in this tournament. It was nearly responsible for an epic first-round upset of #1 overall seed David Letterman as 16-seed and play-in game winner Bridget Bobel lost a heartbreakingly close contest and two double-digit seeeds have advanced to the Elite 8. The moral of that story is anyone is capable of winning this thing with the right amount of fanfare. Facebook it, Tweet it, email it, whatever you need to do to make people aware that your favorite needs their support. Today, we decide who joins Letterman and Miller in the Final 4. You can check out round 1 results here and here, our round 2 results here and here, Sweet 16 results here as well as our most recent bracket (post-Sweet 16 games) with winners here. It’s a battle of BSU alum entrepreneurs as a pizza mogul and the leading Hoosier brewmaster face off in the Frog Baby Regional Final. 1-seed “Papa” John Schnatter is perhaps the most famous pizza maker on the planet. Papa John’s has become an international brand and Schnatter himself has been inducted into the Junior Achievement U.S. Business Hall of Fame in 2007, was named one of the Ten Outstanding Young Americans in 2000 by the National Jaycees Organization, was named 1998 National Ernst & Young Retail/Consumer Entrepreneur of The Year and was inducted in to the Kentucky Entrepreneur Hall of Fame in 2010. Papa John defeated 16-seed Nicholas Ferreri 91%-9% in round 1, 8-seed Jeremiah Johnson 53%-47% in round 2, and 4-seed Kent “Oz” Nelson 84%-16%. 3-seed Scott Wise, or more affectionately known as “Scotty” is making a name for himself throughout the state of Indiana as an entrepreneur and business-owner. The man behind Scotty’s Brewhouse in Muncie has taken his concept throughout the Hoosier state as there is a Brewhouse in West Lafayette, Bloomington, Muncie, three in Indianapolis, and coming soon to Mishawaka. He also opened Three Wise Men brewing company and restaurant in Indianapolis and has become a sought after motivational speaker. Wise defeated 14-seed Sam Smith 93%-7% in round 1, 6-seed Angela Ahrendts 68%-32% in round 2, and Mark “Hot Dog Man” Carter 59%-41% in round 3. In our Beneficence Campus Administration Regional, we see a tourney upstart and a name from BSU’s past square off for this Final 4 berth. 9-seed Chris Taylor currently oversees Ball State’s nationally renowned SportsLink program that is the best in immersion programs for communication. Taylor’s work has allowed the students’ work to appear on national broadcasts through Fox and ESPN. He’s also saw the program handle production duties for the NCAA Tournament and even the Olympics. And oh by the way, Taylor’s also a BSU alum. He defeated 8-seed Paul Schudel 79%-21% in round 1, beat 1-seed John Worthen 78%-22% in round 2, and knocked off 4-seed Brady Hoke 63%-37% in round 3. 11-seed Rick Majerus led BSU to a 43-17 record over his two seasons in Muncie including the school record of 29 wins in 1989. Majerus went on to win 500 games including a National Runner Up title and spent time with both Utah and St. Louis. He defeated 6-seed Ray McCallum 51% to 49% in round 1, 3-seed Don Park 62%-38% in round 2, and 2-seed Jo Ann Gora 53%-47% in round 3. 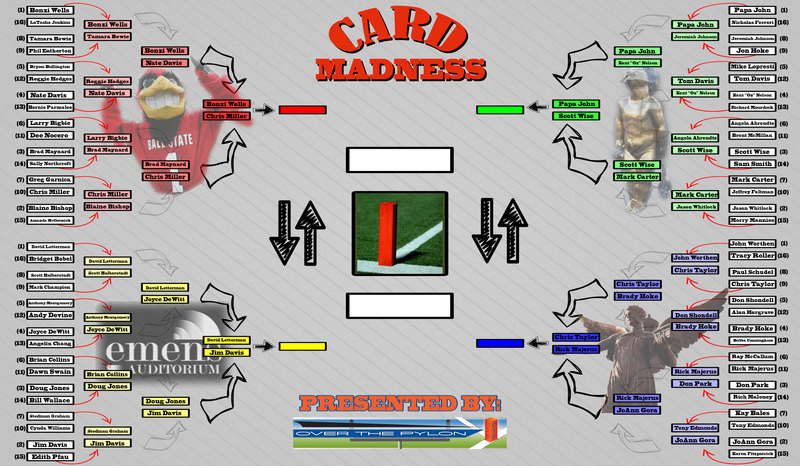 Our Final 4 begins Tuesday April 2 and our CardMadness Champion will be crowned on Thursday April 4. The winners above will square off against each other, while Letterman/Miller makes up the other half. We’re close to a champion, BSU fans. Get yourself ready!